The Tool Every Beer Lover Needs! If you love beer, (and seriously who in their right mind doesn’t), or you know someone who loves beer I can’t recommend strongly enough that you find your way over to tacticalkeychains.com and order a Bottle Grenade 2.0! What is this tool and why would I ever need it to add to my enjoyment of a good brew you are probably asking yourself. Well, I’m happy to enlighten you. The Bottle Grenade 2.0 is a fantastic piece of equipment that fits easily in your pocket or clips on to your belt loop, if you’re so inclined. It can also be fitted with a neodymium magnet during manufacturing so you can attach it to your metallic beer storage device of choice. With a bottle grenade in hand you should be able to tackle any beverage that comes your way, screw top or pry off. Even cans won’t stand in your way if you don’t have any finger nails to pry up the topper. The head can accommodate 19, 21, and 27 tooth caps for twist, the pry head not only makes short work of getting you into a bottle… but it does so without mangling the bottle cap. This little miracle really doesn’t leave a mark on the cap at all. Not sure if people still collect beer caps to track their beer history, but if you do this will be a life saver. If you don’t… maybe you’ll start now that they look less like a mangled piece of metal and more like a keepsake. Before I leave you, I would like to share that I’m no shill for this and I won’t see a penny if all of you go buy every Bottle Grenade 2.0 that Brad can ship out. I have been fortunate enough to back a few of his Kickstarter projects and I must say that he puts a lot of care into the quality of his products. 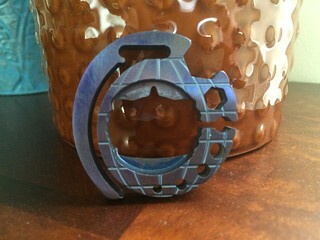 The photos attached are of my Titanium, Anodized Bottle Grenade 2.0 with magnet. Typically it lives on my fridge in the kitchen to facilitate easy opening for those after work adult beverages. The pry top also makes short work of cans if you, a loved one, or even kids have problems getting those pesky cans open.